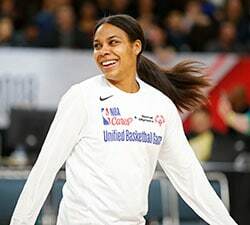 The WNBA will tip off its 23rd season on Friday, May 24, and feature expanded coverage from ESPN’s networks with nationally televised games including ABC and ESPN in addition to an extensive schedule on ESPN2. Live coverage by ESPN’s networks begins on ABC on Saturday, May 25, when Sue Bird, reigning MVP Breanna Stewart and the defending champion Seattle Storm host former MVP Diana Taurasi and the Phoenix Mercury in a rematch of the thrilling 2018 WNBA semifinals series that stretched to a fifth and deciding game. Tip-off is at 3:30 p.m. ET. The ESPN networks’ slate of 16 regular-season telecasts – which will include three games on ABC, two on ESPN, and 11 on ESPN2 – is up from 13 a year ago, when each of those telecasts was on ESPN2. In addition, the WNBA All-Star Game will be broadcast on ABC on Saturday, July 27 from Las Vegas. Coverage on ABC, ESPN and ESPN2 will feature the WNBA’s brightest stars and top teams. All 16 telecasts will feature at least one winner of the WNBA Most Valuable Player Award, including 10 matchups with MVPs going head-to-head. Each of the 16 telecasts will also feature a former No. 1 overall draft pick, with 11 head-to-head matchups between former top picks. Seattle, Phoenix and the Los Angeles Sparks – a 2016 and 2017 Finals participant – will each appear on ESPN’s networks five times. The four-time WNBA champion Minnesota Lynx, 2018 Finals runner-up Washington Mystics, and the Connecticut Sun, which comes off consecutive seasons reaching the playoffs, will appear four times apiece. The WNBA regular season officially starts on May 24 when the Indiana Fever visit the New York Liberty and the Dallas Wings play at the Atlanta Dream. Both games will tip off at 7:30 p.m. ET. The following day, in addition to the Phoenix at Seattle clash, former league MVP Elena Delle Donne and the Mystics visit the Sun (7:30 p.m. 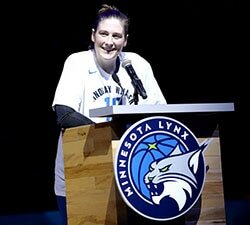 ET) and the Chicago Sky will be at four-time champion Minnesota, where they Lynx are led by former league MVPs Maya Moore and Sylvia Fowles (8:30 p.m. ET). 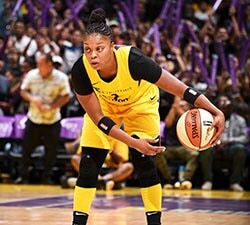 Opening weekend concludes on Sunday, May 26, when the Sparks, led by former MVPs Candace Parker and Nneka Ogwumike and new head coach Derek Fisher, travel to Las Vegas to meet reigning WNBA Rookie of the Year A’ja Wilson and the Las Vegas Aces (8 p.m. ET). Throughout the 2019 season, ESPN Networks will air up to 36 games, including 16 regular-season contests, WNBA All-Star and up to 19 postseason games. All ESPN telecasts will also stream live on the ESPN app. The 2019 WNBA regular season will run from Friday, May 24 through Sunday, Sept. 8. For information about game tickets, visit WNBA.com/tickets. All 16 telecasts will feature at least one winner of the WNBA Most Valuable Player Award, including 10 matchups with MVPs going head-to-head. The MVPs: Los Angeles’ Nneka Ogwumike (2016) and Candace Parker (2008 and 2013), Minnesota’s Maya Moore (2014) and Sylvia Fowles (2017), Phoenix’s Diana Taurasi (2009), Seattle’s Breanna Stewart (2018), and Washington’s Elena Delle Donne (2015). All 16 telecasts also will feature a former No. 1 overall draft pick, with 10 head-to-head matchups between former top picks. The No. 1 picks: Atlanta’s Angel McCoughtry (2009), Connecticut’s Chiney Ogwumike (2014), Las Vegas’ Kelsey Plum (2017) and A’ja Wilson (2018), Los Angeles’ Candace Parker (2008) and Nneka Ogwumike (2012), Minnesota’s Seimone Augustus (2006) and Maya Moore (2011), Phoenix’s Diana Taurasi (2004) and Brittney Griner (2013), and Seattle’s Sue Bird (2002), Jewell Loyd (2015), and Breanna Stewart (2016). Seattle has a series of high profile rematches with a visit to Washington on Aug. 14, when the Storm will tip off against its 2018 WNBA Finals opponent, and televised home and away clashes with Phoenix, which took Seattle to a fifth and deciding Semifinals game in 2018. Another rematch of 2018 Semifinals foes when Washington, which defeated the Dream in a fifth and deciding game last year, visits Atlanta on June 23 (1 p.m. ET).